Recently, I realized my toner was about to run out and my first reaction was, “Oh man, I need to do a review before it’s fully gone!” then “Oh, I should buy a new one.” Blogs, man~. It’s a lifestyle that takes over~. All jokes aside, my toner is going to run out and I’m kind bum about it because it has been treating me nicely for the duration I was using it. So, the back story of this toner goes back to around August 2014. At the time, I was suffering from bad acne. I think it was the humid weather or something, but man, my skin needed help as fast as humanely possible. To SkinFood I went and asked the lady there which toner would help my acne, recommended the Parsley and Mandarin toner. I’ve been using it ever since then and boom, now the end of the toner’s life. I have to admit this. The lady at the store was telling me how the smell of this wasn’t the best and she was pretty spot on about that. With a combination such as Parsley and Mandarin, it definitely has an odd smell. It has hints of a citrus smell, but it gets quickly overpowered by parsley so it doesn’t smell fruity at all. It has more of an herb smell. After using it for a while, it smelt a little like baby powder to me…I don’t know why, but it did. 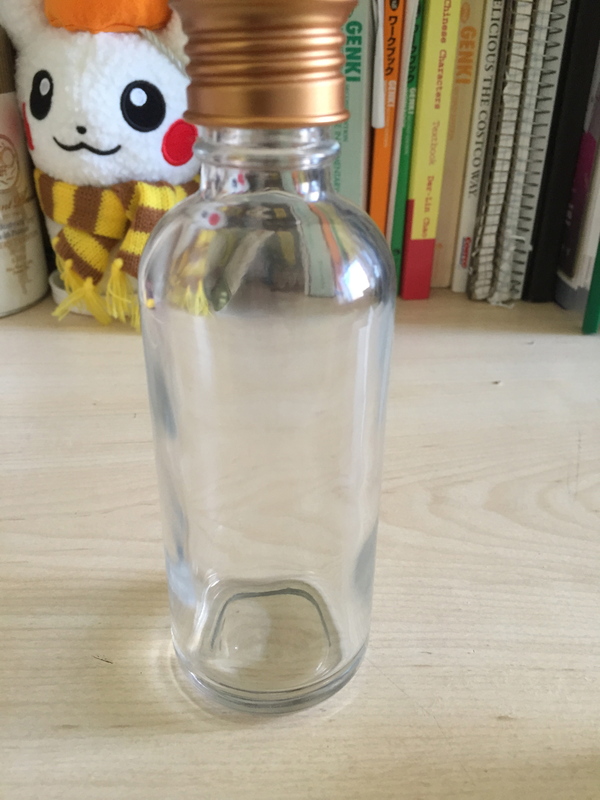 When it comes to the bottle itself, the bottle is made out of thick glass and has some weight to it. I did drop this once and it didn’t crack (thank goodness). The cap has the nice SkinFood emblem on it and after that, it just looks like any bottle for toner with the standard hole at the top that you have to tilt the whole bottle to get the product out. The liquid is clear (and not pictured cause there is a few drops left of it) in the bottle and visible when it’s full. 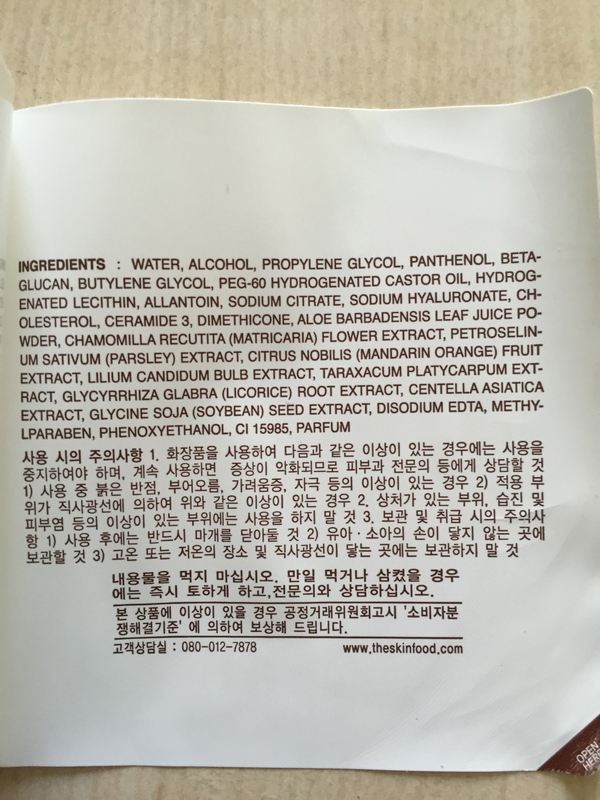 There is 160 ml of the toner which is a little more than some of the other Korean toners I’ve used. As I mentioned before, this toner actually did wonders for me. I really liked it and actually kept my skin clear for quite a while. When I had breakouts, I would wet a cotton pad with this toner and put on my face for about 10-15 minutes before pulling it off. It would help the swelling of pimples and kind of help subdue my breakout to a certain degree. It wouldn’t make the whole thing magically disappear, but it helped my acne from going too crazy. I have to say though when it came to the oilness of my skin, it didn’t really do much. This toner says it’s suppose to help skin irritation such as acne so I won’t hold it against it. Overall, the toner is a pretty solid toner and would recommend it for people who suffering from acne. The smell is a bit off putting, but you do get used to it. I completely got used to the smell and it doesn’t bother me like it used to at first. I would definitely buy this again if I needed it. And here is the last few drops of my toner T^T RIP~!